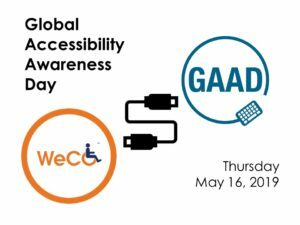 Global Accessibility Awareness Day is an international event that gives us all the opportunity to learn more about digital accessibility. This year’s event is set for Thursday, May 16th and WeCo will be providing it’s 3rd annual FREE after work demonstration and education event. Learn more and register for GAAD 2019 on Eventbrite. Unable to attend in person? We will be streaming this event via Zoom! WeCo offers FREE, and affordably priced “per seat” training. Perfect for small teams, or individuals. Classes offered onsite in Minneapolis OR online. Live captioning is always a part of our online classes. If you’re attending onsite, we provide coffee and refreshments. Upcoming classes listed below. Complete list of our current/past training events on Eventbrite. Metered parking available next to and behind the building / area served by bus and train. 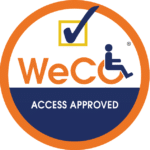 WeCo’s free training classes are a part of our mission to build a more accessible world, and a perfect place to start your accessibility initiative. Learn what digital accessibility means from the viewpoint of users living with sight, mobility, hearing and cognitive disabilities. Simple steps to get started on making your website/software accessible is part of this free class. Keep up with the latest iteration of the Web Content Accessibility Guidelines (WCAG) with this free lunchtime webinar. Led by WeCo’s Accessibility Specialists, digital experts who also live with disabilities. (Web or Mpls) NEW free lunch hour class! WeCo’s newest free training class will help you assemble statistics and ROI information to convince stakeholders and leadership that accessibility is the right thing for your organization. Taught over the noon hour! Need information on making a business case for accessibility right now? Check out our Make a Business Case web page. It’s packed with current information and resources! WeCo’s affordable technical training classes are perfect for individuals, small staff teams, or larger organizations who need to train new team members. Comprehensive training on how to bring WCAG 2.1 to life in your website/software. Practical application from WeCo Accessibility Specialists, digital professionals who also live with disabilities, it’s our most popular training for developers, content managers and programmers. Explore how UX differs for people living with sight, mobility, cognitive and hearing disabilities and how to address their needs. You’ll learn directly from WeCo’s Team of Accessibility Specialists, who also live with disabilities. It’s possible for your team to learn how to create accessible emails, documents and PDF’s as well as convert existing ones to accessible formats. Learn directly from WeCo’s Accessible Document Specialists with hands-on exercises and guidance. Choose either onsite Mpls or web training options. Not finding what you’re looking for? WeCo provides customized training. 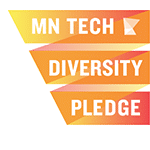 Accessibility Twin Cities is a MeetUp designed to bring together people who work in the accessibility testing industry, as well as those just interested in learning more about how digital accessibility works. Join us for wine and small bites in a relaxed after-work setting at WeCo’s downtown Minneapolis office for bi-monthly gatherings for accessibility testing professionals. We meet on the last Monday of each month. Sign up for ATC on our MeetUp website. Once you’re sign up, you’ll receive invitations and reminders for all of our meetings. ATC meets on the last Monday of every other month, beginning in January. Happy Hour begins at 5:30 p.m. Program runs from 6:00-7:30 p.m.